At Butler Primary School we have a clear vision and purpose to be recognised as a school focusing on high quality teaching. Our ultimate aim is to give each student the best education and equip them with skills to adapt and flourish within a constantly changing world. When making direct deposit payments please reference your child's name and payment code or description. 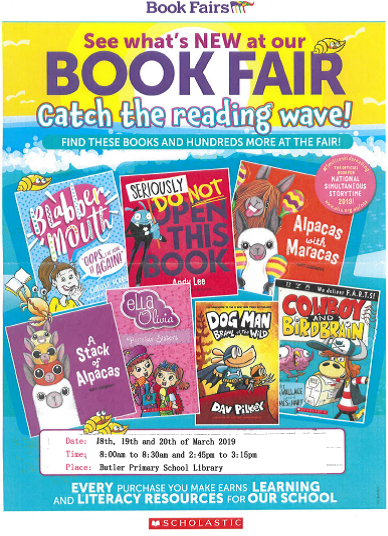 Book Fair is on from 18-20 March between 8.00am to 8.30am and 2.45pm to 3.15pm in the Library. All students are invited to wear red on Thursday, 14 February for a gold coin donation. Proceeds to Heart Research Australia. Click here to view the December 7 Schoolzine eNewsletter! Check out what’s coming up soon. Sign your child up today. What’s in the menu this week?